A new program based in Vancouver,B.C. Canada is using marijuana as an aid in with drawing from methadone.The marijuana is bud placed in capsules and rated in strengths from 30-100 mgms.The patient is brought down in methadone dosage as always.The difference is that the patient is given capsules of marijuana to be taken at bedtime to ease any discomfort from the drop in dose.The one person I know that has gone through the program successfully is off the methadone and expressed that the discomfort was minimal and that she:"slept through the whole thing".There were a few(4)days of minor discomfort but the marijuana eliminated the long nights that the lessening of a methadone dosage can cause and the weeks of sleepless nights following the last dose of methadone were non existent.The person in question went from a dosage of 75 mgms a day to nothing in just under two months.This after a 6 year addiction to methadone and many years on the street doing heroin and cocaine.I am as aware as anyone that the major factor in any of these success stories is that the person in question wants to quit and is ready to do so.That being said,this was a really easy withdrawal and I was as amazed as anyone that marijuana was in any way effective in easing the pain of the experience.This is a major improvement over the clonidine that was used when I was imprisoned the last few times.In the early seventies the prison(Okalla) used to use methadone to withdraw addicts from heroin.It was a painful experience but far less harmful than the alternative.Then the doctor that was sympathetic to addicts retired(he had delayed his retirement long into his 70's as he knew as soon as he left the institution would revert back to the cold turkey that the other B.C. prisons used)and sure enough the medical staff decided that the heroin was so diluted that methadone was no longer required.Perhaps one day they will take a page from this program and use marijuana,at least as a sleeping aid while kicking a habit.I always felt that an addict did more time in the first month than other inmates did in a year.Lets hope that this program is given the attention it deserves.I'm afraid that as soon as the ruling against federal drug laws is over that the Harper government will pretend that this and other programs that are showing success will be stopped and filed away in some dusty corridor in Ottawa,never to be heard from again.They will have a tough time explaining why a program that actually got someone off methadone with relatively little discomfort failed to inspire them but they have a long history of ignoring evidence in favor of moral doctrine.Lets hope the program has enough data to support it's continuation in spite of the conservative governments prejudices. The losers in New York state's effort to reform its draconian Rockefeller drug laws, mainly district attorneys and Republican legislators, made a last-ditch effort this week to scuttle part of the reforms. But given a strong response from reform proponents, Gov. David Paterson (D), and Assembly Democrats, the effort appeared dead in the water as the week wound down. The brouhaha erupted over a provision in the law that allows judges the discretion to conditionally seal some nonviolent conviction records when a person has completed drug treatment. The reason for the provision is simple: To make it possible for people who have successfully undergone treatment to be able to enter the workforce without having the albatross of their nonviolent, pre-treatment drug convictions hanging around their necks. With the Rockefeller reform law set to go into effect next week, Senate Republican minority leader Dean Skelos headlined a Monday press conference to warn that allowing judges to seal the records of "dangerous criminals" was a threat to the safety of New Yorkers. "This is one that is potentially going to kill people if it's not repealed," said Skelos (R-Rockville Centre). "This is about life and death." "It's just mind-boggling in terms of the impact of this provision," said Sen. Frank Padavan (R-Bellerose) the primary sponsor of the effort to undo the provision. "This change in our state drug laws defies all common sense because it would effectively wipe the slate clean for criminals who will face necessary criminal background checks for positions of confidence and public trust." "It means someone convicted of selling drugs on a school yard could be hired as a teacher," Skelos added. "Someone caring for toddlers, someone running a crystal meth lab could be delivering medications to your grandmother at a nursing home. And an individual convicted of forgery or grand larceny could be handling your money at the bank or taking your application for a loan or credit card." DAs also joined in the attack. "If you look at the list of jobs and licenses that you are going to be able to get without having your criminal drug activity revealed to a potential employer is remarkable," Staten Island District Attorney Daniel Donovan, who heads the state's district attorneys' association, told the Ithaca Journal. Sounds pretty scary, and that scare tactic worked, at least to some degree. Senate Democrats initially wavered, saying they might take up the issue. On Wednesday, Sen. Eric Schneiderman (D-Manhattan), the Senate sponsor of the Rockefeller reform bill indicated he will try to delay the implementation of the record-sealing provision. But on closer analysis, the Republicans' and the prosecutors' appeal to public safety appears threadbare, one might even say hypocritical, especially given that DAs have held the same power to seal conviction records for decades -- and have used it expansively with little scrutiny. The new provision is much more transparent. Under this provision, a judge may order records to be conditionally sealed only after a person has successfully completed both a judicially-supervised drug treatment program and the court-imposed sentence for the offense, and after the judge considers, among other things, the circumstances and seriousness of the offense, the character of the defendant, his or her criminal history, and the impact of the sealing on public safety. A judge must also give the district attorney notice and an opportunity to be heard and may deny a sealing request even if the applicant has completed drug treatment. Even while signaling he might be open to delay to discuss the provision, Schneiderman defended the bill. "A defendant should be able to go to a judge and say the prosecutor wouldn't do this for me," he said. "Now the judge can overrule the prosecutor," he added before going on to accuse the GOP of trying to "terrorize the citizenry." If Schneiderman was intimidated by the Republican onslaught, some of his fellow Senate Democrats weren't. Senate Crime Committee Chairwoman Ruth Hassell-Thompson (D-Mount Vernon) said in a statement that the criticism "is an alarmist attitude of a few who refuse to accept the notion that many of these former addicts have served their time and proven themselves worthy of a second chance." Nor were reform proponents taking the attack lying down. "The real issue here is not about sealing, but who gets to decide," said Gabriel Sayegh, project director with the Drug Policy Alliance. "Prosecutors have been sealing records for years, and so long as they held the discretion to seal records, they didn't mind sealing. But now that discretion has been returned to judges, the prosecutors have objections to the practice. This isn't about record sealing, which works when done right. It's about who gets to decide, and prosecutors don't want to lose control over the process." "The right-of-center representatives and law enforcement officials, mainly DAs, are trying to make political hay out of this issue and are using fairly old-school tactics to bum rush the public into being scared," said Robert Gangi, executive director of the Correctional Association of New York, a member of the Rockefeller reform coalition Drop the Rock. "But I think our side has defended the sealing provisions very eloquently and forcefully." "People with past criminal histories -- no matter how old or the nature of the record -- are often indefinitely denied access to many spheres of society including employment," said Anita Marton, vice president of the Legal Action Center. "This provision increases employment opportunities, so people can truly be given a second chance at succeeding in and contributing to society. This is smart policy." "Prosecutors and some opportunistic elected officials want to set up road blocks and stigmatize people by prohibiting judges from sealing records for people who have successfully completed their drug treatment," said Anthony Papa, communications specialist at the Drug Policy Alliance, who served 12 years for a first time nonviolent drug offense. "We should be removing barriers for people who are reentering society so they can function as productive, taxpaying citizens, and access to employment is an important part of that." By Wednesday, Gov. David Paterson (D) had weighed in, saying the law should stand as is. The reforms are aimed at giving judges discretion in diverting nonviolent drug offenders to treatment instead of prison, he said, and people who complete such programs should not be penalized when seeking work. "We feel it helps society to try to place them in homes and in jobs without putting the scar of their addiction on them," he said during a meeting with legislators to discuss the matter. The governor's statement was on the money, said Gangi. "Sealing the records is actually a very good idea that doesn't increase the risk to public safety," he said. "People who have gone through treatment and avoided prison are going to continue to do well. We don't want to place obstacles in their path." With Paterson standing firm and Assembly Democrats right there beside him, the issue should be dead now, said Gangi. 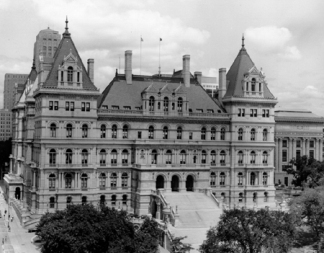 "The Assembly Democrats won't even be considering looking at this," he said, "even if the Senate Democrats waiver. With the governor's support and if the Assembly Democrats hold the line, this is even more of a non-starter. It should be case closed, and let's move on to the next pressing matter." My, how the mighty have fallen! Up until last year, DAs and their Republican allies in the state legislature were able to beat back reform with the clubs of fear-mongering and demagoguery. Now, they appear lonely losers, their appeals to fear scoffed at, their shrieks of discontent lost in the wind. 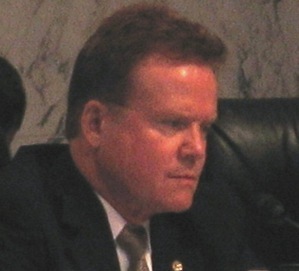 US Sen. Jim Webb (D-VA) yesterday introduced a bill that would create a commission designed to overhaul the US criminal justice system. The bill would create a commission that would have 18 months to do a top-to-bottom review of the criminal justice system and come back with concrete, wide-ranging reforms to address the nation's sky-high incarceration rate, responsd to international and domestic gang violence, and restructure the county's approach to drug policy. "America's criminal justice system has deteriorated to the point that it is a national disgrace," Webb said in introducing the bill. "Its irregularities and inequities cut against the notion that we are a society founded on fundamental fairness. Our failure to address this problem has caused the nation's prisons to burst their seams with massive overcrowding, even as our neighborhoods have become more dangerous. We are wasting billions of dollars and diminishing millions of lives. We need to fix the system. Doing so will require a major nationwide recalculation of who goes to prison and for how long and of how we address the long-term consequences of incarceration." Any other area that the Commission deems relevant. Sen. Webb is also looking for policy change recommendations on drug policy, reentry programs for ex-offenders, prison reforms, and how better to deal with international and domestic criminal organizations. That Webb should introduce such a sweeping bill comes as little surprise given his history of interest in the field. In 2007, he led a Joint Economic Committee hearing on mass incarceration, and last year, he led another Joint Economic Committee hearing on the economic cost of drug policy, as well as returning to the theme on various other occasions. The bill does not yet have a number. A panel of federal judges charged with overseeing the California prison system tentatively ruled Monday that the state must release tens of thousands of inmates from its swollen prison population to reduce overcrowding. The three-judge panel said that no other action would improve conditions so awful that inmates regularly commit suicide or die from lack of proper medical care. The state must present a plan to bring inmate numbers down within two to three years, the judges said. They suggested a target of 108,000 to 121,000 inmates from the current California prison population of around 158,000. That would mean that somewhere between 36,000 and 50,000 prisoners would be freed. According to the California Department of Corrections and Rehabilitation Services year end 2007 report, some 34,000 drug offenders were imprisoned in the Golden State. That figure includes some 1,500 marijuana or hashish offenders. "There are simply too many prisoners for the existing capacity," they wrote in the 10-page order. "Evidence offered at trial was overwhelmingly to the effect that overcrowding is the primary cause of the unconstitutional conditions that have been found to exist in the California prisons." The San Francisco-based panel said it may hold more hearings before making the decision final. It suggested the state could reduce the prison population by the amount required through changes in parole and other policies without endangering the public safety. Reducing the size of the nation's largest state prison system "could be achieved through reform measures that would not adversely affect public safety, and might well have a positive effect. This is particularly true considering that California's overcrowded prison system is itself, as the governor, as well as experts who have testified before the Court, have recognized, a public safety hazard," the judges said. The order came quickly after the judges heard two days of closing arguments last week. The judges said they hoped to force the state to either reach a settlement with attorneys for the inmates who brought the lawsuit or to act on its own to rectify the situation. Previous negotiations had failed to achieve a settlement, leading to a two-week trial in November and December. 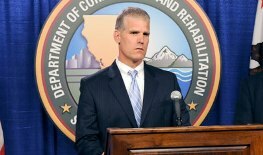 "Obviously, the governor and I strongly disagree with the panel's conclusions and our response will be based on how best to protect the public from a court-ordered release of inmates," said CDCR Secretary Michael Cate said in a statement. But the judges said California largely brought the problem on itself, and that savings from reforms could help pay for reentry services for the expected flood of ex-inmates. "California, like most other states, is in the throes of an unprecedented economic crisis," the panel noted. State law enforcement, courts, and rehabilitation services are stretched tightly in the state's $42 billion budget deficit crisis. The judges pointed out that the CDCR has projected it could save $800 to $900 million a year by sending fewer parolees back to prison on technical violations and by increasing good time for inmates who take classes and vocational programs. "It appears from these figures that the State could easily fully fund all the community rehabilitative and other programs... without expending any funds other than those regularly provided in the prisons budget," the judges wrote. This is not a done deal yet, but we could be seeing the beginning of the end of California's massive over-incarceration binge. Too bad it's taking an intervention by the federal courts to wean the state of its addiction to mass imprisonment. With drug strategies and welfare reform plans in the British Isles moving toward pushing drug users into treatment and from treatment into the workplace, the British government is going to have to do a lot more to help drug users find jobs, a leading British drug policy think tank said in a report released this week. The report, Working Toward Recovery: Getting Problem Drug Users Into Jobs was published by the UK Drug Policy Commission and contains more than three-dozen recommendations aimed at easing the transition. The report noted that while holding a job is a key component of drug user rehabilitation and integration into society, about 80% of problem drug users were unemployed. (The report defined "problem drug user" as someone dependent on heroin or crack cocaine.) And while government strategies in England, Scotland, and Wales are to get users off drugs and into jobs, the strategies are undeveloped and, and employer practices sometimes counterproductive. In particular, the report criticized the informal "two years drug free" rule used by many employers. With the two years of abstinence including abstinence from opiate substitute medications, such as methadone, the practice is unduly harsh and unnecessary, given that many people on the controlled drug regimen have already achieved the stability employers say they want. Employers are unlikely to want to hire problem drug users, with only 26% saying they would be prepared to hire a former drug user. Employers cited several types of risk associated with drug users -- from continuing drug use, to the firm's reputation, and to the firm's customers and employees -- and about three-quarters of them they needed more government help in developing risk assessments, support for drug using employees, and information about indemnity insurance. The Labor government's welfare reform proposals will tie money to pay for drug treatment to drug users agreeing to a rehabilitation plan, the study noted. But with employment a big part of rehabilitation, the government is going to have to provide incentives and programmatic support if it is going to force those drug users into the job market. With the presidential election now less than a month away, Democratic candidate Barack Obama appears poised for victory, according to the most recent polls, though the race is far from over. From the beginning of the campaign, drug reform and drug policy have barely registered in the discourse, a state of affairs that has grown even more pronounced as the country slips into economic crisis and the news media focuses obsessively on the two major party candidates, their campaigns, and their responses to the crisis. Despite the silence at the presidential level, there is an emerging consensus in the country that the war on drugs is a failure -- 76% of respondents in a Zogby poll last week said so -- and there are several presidential candidates whose drug policy platforms actually appeal to drug reformers. With one major party candidate or another establishing clear leads in most states, the presidential election will be decided in a handful of battleground states, and that means drug reformers in the remaining states have the option of voting for candidates whose views resemble their own without jeopardizing the chances of their favored major party candidate. "Narcotics abuse and trafficking continues to be a problem that state, local, and tribal law enforcement officers face every day. How would you ensure that enforcement, prevention, and treatment programs receive equal resources and assistance to combat this growing problem?" asked the police chiefs. "Illegal narcotics are a scourge that I have fought against for my entire legislative career, and I believe this fight must begin with prevention and enforcement. That is why I introduced the Anti Drug Abuse Act of 1988 during my first term in the Senate and supported the Drug Free Borders Act of 1999, which authorized over $1 billion in funds to bolster our ability to prevent drugs from flowing through our borders and ports by improving technology and expanding our interdiction forces. As president, I would continue these efforts to ensure that our nation's children are protected from the influence of illegal drugs and that the drug peddlers are brought to justice for their crimes. We must also realize that treatment is an important element of the mission to eradicate drug abuse. I supported the Second Chance Act, which authorized up to $360 million for violator reentry programs in 2009 and 2010. Last year, approximately 750,000 inmates were released from custody and returned to our communities, and typically one half will return to incarceration. The Second Chance Act funds programs that prepare prisoners for the transition from prison to society by providing job training, mentors, counseling, and more. Some programs report reducing recidivism rates by 50 percent. These programs could save American taxpayers hundreds of millions of dollars. On average, the annual cost of incarcerating a prisoner exceeds $20,000 -- a number that increased sixfold between 1982 and 2002. As president, I believe we should support having parents with children in the home rather than in prison, former prisoners working and paying taxes, and citizens contributing to rather than taking from the community." "Drug trafficking has long been a scourge on our society, and we need a national drug policy that focuses on tackling new threats with tough enforcement measures while also providing for robust prevention and treatment programs. All three of these components -- enforcement, prevention, and treatment -- are critical to a complete national drug control strategy, and each will be a key part of my agenda in an Obama-Biden administration. 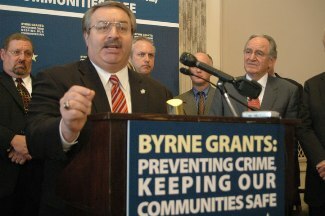 Funding the Byrne Justice Assistance Grant (Byrne-JAG) Program is essential to avoid law enforcement layoffs and cuts to hundreds of antidrug and antigang efforts across the country. The administration has consistently proposed to cut or eliminate funding for the Byrne-JAG Program, which funds antidrug and antigang task forces across the country. Byrne-JAG also funds prevention and drug treatment programs that are critical to reducing US demand for drugs. Since 2000, this program has been cut more than 83 percent. These cuts threaten hundreds of multijurisdictional drug and gang task forces -- many that took years to create and develop. In my home state of Illinois, the Byrne grants have been used effectively to fund anti-meth task forces, and I have consistently fought for increased funding for this program. As president, I will restore funding to this critical program. Finally, it's important that we address the crime and security problems in Latin America that have clear spillover effects in the United States in terms of gang activity and drug trafficking, which is why I introduced a comprehensive plan to promote regional security in the Americas in June. I will direct my attorney general and homeland security secretary to meet with their Latin American and Caribbean counterparts in the first year of my presidency to produce a regional strategy to combat drug trafficking, domestic and transnational gang activity, and organized crime. A hemispheric pact on security, crime, and drugs will permit the United States, Latin America, and the Caribbean to advance serious and measurable drug demand reduction goals, while fostering cooperation on intelligence and investigating criminal activity. The United States will also work to strengthen civilian law enforcement and judicial institutions in the region by promoting anticorruption safeguards and police reform. I will also support the efforts of our border states to foster cooperation and constructive engagement with the region. Arizona, for instance, has entered into agreements with its neighboring Mexican state, Sonora, to cooperate on fighting border violence and drug trafficking. These agreements have led to the training of Sonora detectives to investigate wire transfers used to pay smugglers in their state; improved radio communication; and better tracking of fugitive and stolen vehicles. The Arizona-Sonora partnership -- based on information sharing, technical assistance, and training -- provides an excellent model for regional cooperation on security issues. An Obama-Biden administration will support these initiatives and will work to integrate these efforts into the region's coordinated security pact." While the Obama and McCain campaigns differ slightly in their emphases on different drug policy-related issues, there is more similarity than difference between them. Both refer to drugs as a "scourge," both brag about their anti-drug achievements, both support US drug war objectives across the border and overseas. But even though there is much to unite Obama and McCain on overall agreement with drug prohibition, there are differences, too, some of them significant. While neither Obama nor McCain support marijuana decriminalization, Obama once did, until he reversed position during this year's election campaign. Whether Obama's flip-flop on decrim says more about his good initial instincts or his political opportunism is open to interpretation. Similarly, as the Sentencing Project showed in a March report on the candidates' positions on drug and criminal justice policy, while McCain has supported mandatory minimum sentences for "drug dealers," Obama in 2003 told an NAACP debate he would "vote to abolish" mandatory minimums. By this year, Obama had slightly softened his stand on mandatory minimums, saying on his web site, "I will immediately review these sentences to see where we can be smarter on crime and reduce the ineffective warehousing of nonviolent drug offenders." Although Obama has tacked to the center (read: right) during the campaign season, other of his drug policy positions remain superior to McCain's. Obama supported lifting the ban on federal funding of needle exchanges; McCain did not address it. Obama explicitly supports drug courts; McCain does not, although he has stated he thinks too many drug users -- not drug dealers -- are in prison. Obama supported reducing the disparity between powder and crack cocaine offenders, even sponsoring a bill that would equalize sentences; McCain has not addressed the subject. Obama has said he would stop the raids on medical marijuana patients in California; McCain would not. Obama sees drug policy in the broader context of social justice; McCain has not opined on that idea. Still, contrast Obama and McCain's drug policy positions with those of the Greens, the Libertarians, and the Ralph Nader campaign, and real differences emerge -- mainly between the bipartisan drug policy consensus and the three alternative campaigns. Law enforcement is placing too much emphasis on drug-related and petty street crimes, and not enough on prosecution of corporate, white collar, and environmental crimes. Defrauding someone of their life savings is the same as robbery. Any attempt to combat crime must begin with restoration of community. We encourage positive approaches that build hope, responsibility and a sense of belonging. Prisons should be the sentence of last resort, reserved for violent criminals. Those convicted of nonviolent offenses should be handled by other programs including halfway houses, electronic monitoring, work-furlough, community service and restitution programs. Substance abuse should be addressed as a medical problem requiring treatment, not imprisonment, and a failed drug test should not result in revocation of parole. Incarcerated prisoners of the drug war should be released to the above programs. Repeal state "Three Strikes" laws. Restore judicial discretion in sentencing, as opposed to mandatory sentencing. Stop forfeiture of the property of unconvicted suspects. It is state piracy and denial of due process. Implement a moratorium on prison construction. The funds saved should be used for alternatives to incarceration. We call for decriminalization of victimless crimes. For example, the possession of small amounts of marijuana. We call for an end to the "war on drugs." We support expanded drug counseling and treatment. Government exists to protect the rights of every individual including life, liberty and property. Criminal laws should be limited to violation of the rights of others through force or fraud, or deliberate actions that place others involuntarily at significant risk of harm. Individuals retain the right to voluntarily assume risk of harm to themselves.... We oppose reduction of constitutional safeguards of the rights of the criminally accused. Like the Greens and the Libertarians, the Ralph Nader campaign has a solid drug reform platform, as suggested by its title, "The Failed War on Drugs:"
The Nader campaign supports ending the war on drugs and replacing it with a health-based treatment and prevention-focused approach. Enforcement of drug laws is racially unfair, and dissolution of the drug war would begin to make the types of changes needed in our criminal justice system. According to the federal Household Survey of drug use, "most current illicit drug users are white. There were an estimated 9.9 million whites (72 percent of all users), 2.0 million blacks (15 percent), and 1.4 million Hispanics (10 percent) who were current illicit drug users in 1998." And yet, blacks constitute 36.8% of those arrested for drug violations, over 42% of those in federal prisons for drug violations. African-Americans comprise almost 58% of those in state prisons for drug felonies; Hispanics account for 20.7%. The drug war has failed -- we spend nearly $50 billion annually on the drug war and yet problems related to drug abuse continue to worsen. We need to acknowledge that drug abuse is a health problem with social and economic consequences. Therefore, the solutions are -- public health, social services, economic development and tender supportive time with addicts in our depersonalized society. Law enforcement should be at the edges of drug control, not at the center. It is time to bring some currently illegal drugs within the law by regulating, taxing and controlling them. Ending the drug war will dramatically reduce street crime, violence and homicides related to underground drug dealing. But also like the Greens and the Libertarians, Nader has virtually no chance of winning any state. Most recent presidential campaign polls don't even bother to include anyone besides Obama and McCain, and the most recent poll that included the three minor party candidates, late July Angus-Reid poll, found McKinney, Barr, and Nader combined for only 10% of the vote. Nader polled 6%, Barr 3%, and McKinney 1%. Still, drug reformers must once again face that perennial question: Should I vote for the major party candidate who is less bad on drug policy, or should I vote for a candidate that reflects my views on this issue? Not surprisingly, there is a variety of views. Veteran drug reformer Kevin Zeese acted as a Nader spokesman during the 2004 campaign and ran for the US Senate in Maryland as the nominee of both the Green and the Libertarian parties. He still believes third party politics is the answer, he told the Chronicle. "Until reformers have the courage to vote for what we want why will anyone else? Neither duopoly party will end the drug war -- they are not even discussing it," he said. "The better duopolist picked a leading drug war hawk as his vice president. No doubt many will hope that Biden will pull a Nixon goes to China and reverse himself -- but that is really blind hope." Drug reformers, especially those in non-battleground states, should send the major parties a message, said Zeese. "Voting for Obama is a true wasted vote in a non-battleground state," he said. "We know how the Electoral College will vote in 40 states. If you disagree with Obama or McCain -- why vote for them in those states? It is important for these parties to see that people are not satisfied with them. If you vote for Obama or McCain when you disagree with them then you are sending a signal of agreement. Why should he change? If you vote against them, they know they have to change in order to earn your vote." Veteran drug reformer Cliff Thornton, who ran for the governorship of Connecticut on a drug reform platform as a Green Party candidate in 2006, agrees with Zeese. "McCain will just be more of the same, and I don't really know what Obama will do," he said. "Let's just note that Joe Biden was one of the architects of mandatory minimums. If Obama wins, I'm afraid we will have to wait for the next election to see any progress. We need to be supporting alternatives, and a vote for a Green is vote for a Green," he said. But for Bill Piper, national affairs director for the Drug Policy Alliance Network, the lobbying arm of the Drug Policy Alliance, the differences between Obama and McCain on drug policy, while marginal, are significant. "In terms of reducing the harms associated with both drugs and drug prohibition, the difference between Obama and McCain is big," Piper argued. "Obama supports repealing the federal syringe ban, eliminating the crack/powder cocaine sentencing disparity, reforming mandatory minimums, and shifting resources from incarceration to treatment. McCain hasn't said anything major one way or the other about syringe exchange programs or the crack/powder disparity from what I can tell, but has publicly made fun of medical marijuana patients and introduced legislation to essentially ban methadone." While conceding that it is difficult to predict how either Obama or McCain would govern, Piper argued that an Obama presidency is much more likely to see drug reform. "In terms of seeing a wide range of reforms at the federal level over the next eight years, it seems far more likely to happen under Obama than McCain," he said. Not likely, retorted Zeese. "Biden will be whispering drug war nonsense in his ears, and his past use of marijuana and cocaine will be reasons that stop him from doing anything sensible," he predicted. "The best we can hope for from Obama is benign neglect. There will be many other domestic and international crises for them to deal with so drug policy will not be high on their agenda -- that is good news -- because Biden is the source of most of what is wrong with modern drug policy. Hopefully, he is kept busy doing something else." And, said Piper, Obama is not talking about ending drug prohibition, dismantling the prison-industrial complex, and putting violent drug trafficking organizations out of business. "Only Barr, Nader, and McKinney are talking about major reform. They're speaking for the 76% of Americans who say the war on drugs has failed. But they've been excluded from the debates and are largely being ignored by the media. I know a lot of drug policy reformers who are voting for one of them. I know a lot, probably more, who are voting for Obama, and some who are voting for McCain." Who drug reformers should vote for remains a tricky, personal question, said Piper. "There are a lot of variables to consider, including weighing the possibility of important, short-term incremental gains against the need for long-term systematic change; pondering the question of whether or not change on the margin facilitates or obstructs major change; deciding if the drug war should be the only issue you vote on or just one of many; thinking about the political and cultural changes that have to occur to bring down prohibition and how this election fits into that; considering what state you live in; and wrestling with your conscience," he said, ticking off the issues confronting drug reform voters. "I don't think there is one right answer."